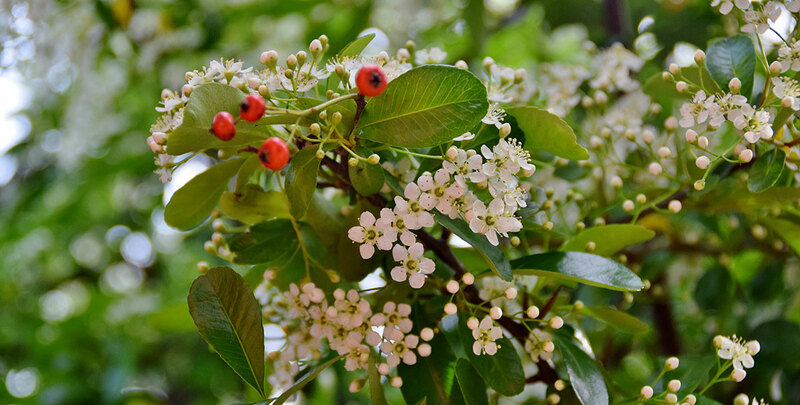 The firethorn, also known by its botanical name pyracantha, is a tough, evergreen shrub in the rose famiy or rosaceae. In the wild, it is found growing from the southern parts of Europe all the way to Southeast Asia. The firethorn is somewhat similar to the hawthorn (crataegus monogyna) for which it is sometimes mistaken. There are, however, a few significant differences between the firethorn and that typically British countryside hedging plant. First of all, the firethorn grows striking, multicoloured and profuse berries, in contrast to the less showy and exclusively red hawthorn berries. Even more importantly, the native hawthorn is a deciduous shrub, while the non-native pyracantha is an evergreen, which means a firethorn hedge will remain dense throughout the winter months. Due to their sharp thorns and branches, firethorn species will make large, dense and impenetrable hedges, but they can also look amazing when trained against a wall or a fence. They have simple, serrated leaves, fragrant white flowers and berries in various colours, depending on the variety chosen. And there are plenty available, most of them deriving from the coccinea species or scarlet firethorn. In fact, all of the cultivars selected on this website belong to the coccinea branch. And with names like 'Red Column', 'Golden Charmer' and 'Orange Glow', it is fairly obvious that we are dealing with a hedging plant that is particularly loved for its colourful appearance. If you are looking for a hedge that will keep intruders out, however, firethorn hedges will also do the trick. The thorny branches of a firethorn hedge are not just excellent for keeping human or animal intruders away from your garden; the stems and branches provide excellent nesting opportunities for birds. They will certainly keep cats and other predators at a distance. As the fruits of firethorn species appear during the winter months, they also provide a source of nutrition for birds in the cold months, during which food is relatively scarce. In addition, the berries are very decorative and a beautiful sight in an otherwise rather barren winter garden. These fruits are even edible for humans and can be cooked to make jams, jellies and sauces. Cooking them is essential, as the berries are rather bitter and astringent when raw. Before the red, yellow or orange berries appear in the autumn and winter, a firethorn hedge grows attractive, fragrant flowers that come out during the spring or early summer. These white flowers are an important source of nectar for bees, especially during the month of June. 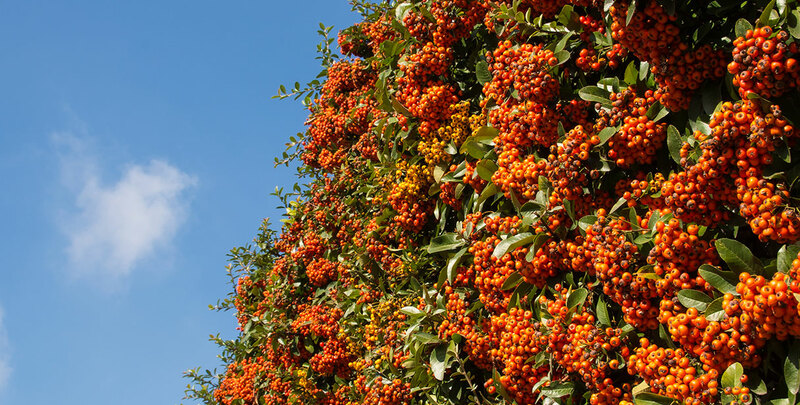 While the combination of its dense, elegant foliage and its white flowers or colourful berries makes a firethorn hedge a beautiful sight, its strength should not be underestimated. It is often planted in public parks due to the simple fact that it is beautiful, but the fact that firethorn species are resistant to all diseases except for scab and fire blight confirms their reputation as tough, excellent hedging plants. Firethorn hedges are normally fully hardy and you can be sure that they will thrive in most conditions. They will prefer a position in the full sun or partial shade though. Firethorn can be planted in any moderately fertile soil and responds well to dry conditions, as long as the plants are well established. Watering is required only during the first couple of years. Too much shade may result in poor berrying. Also, avoid exposed sites. 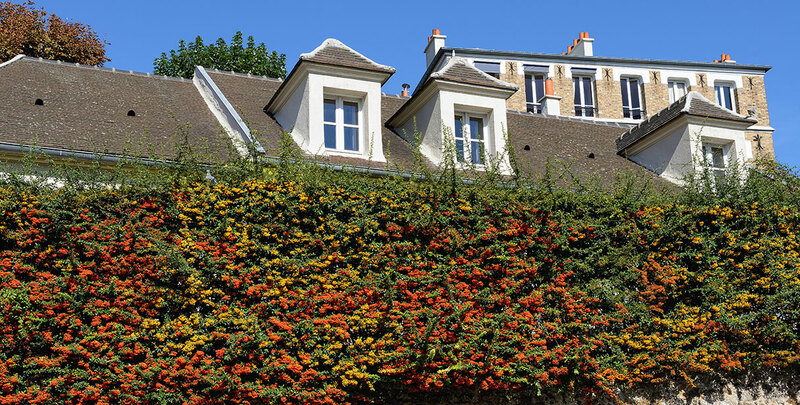 Firethorn hedges are quick growers with an annual growth rate of around 50 centimetres. They are easy to maintain and respond well to (hard) trimming, but try to avoid pruning away the growth from last year in order to ensure flowering and berrying for the upcoming year. Firethorn is best pruned from spring to late summer. Side shoots can be shortened until you reach the berries, but always try to retain as many berries as possible. While firethorn hedges are very tolerant of pruning, the thorny branches that keep intruders at a distance also make maintenance a little difficult. However, if you use gloves and protective clothing, it is certainly possible to trim your firethorn hedge in a way that will not harm its dense, impenetrable nature or colourful appearance. Most firethorn species reach an ultimate height of approximately 1.50 meters, though the “golden charmer” cultivar can grow up to 4 metres tall and the “red cushion” is best kept under a metre in height. Some people say you cannot have it all, but a firethorn hedge is the ultimate combination of strength and beauty. 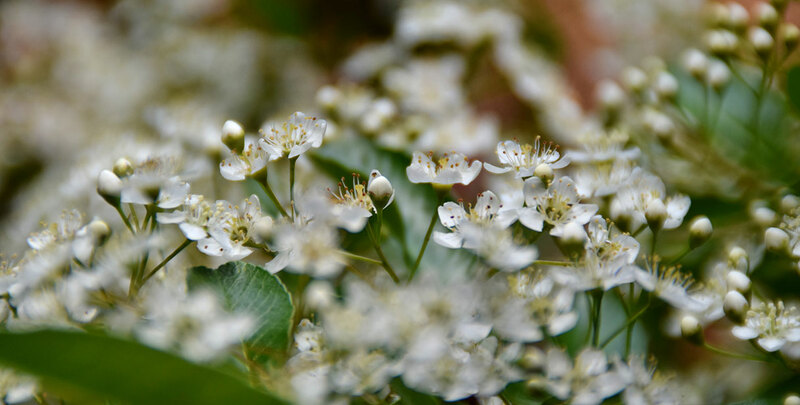 Its green leaves, white flowers and multicoloured berries make an irresistible display of colour, while burglars and animal intruders will think twice before even attempting to get through the dense, thorny branches of the firethorn. In addition, its resistance to several diseases makes a firethorn hedge stronger than many hedges that are similarly vibrant in terms of colour. Firethorn hedges are available in many different colours, so you can choose the variety of which the colour appeals to you most or simply combine different varieties to create an almost kaleidoscopic effect in your garden. Whether you need a security hedge for keeping intruders out, or simply something to make your garden look a little more beautiful, a firethorn hedge will deliver. In fact, you are also doing wildlife a favour by planting a firethorn hedge in your garden, as it provides nutrition and protection to many small animal species.